With a team of professional engineers, we manufacture and export the metal bins made from high grade material sheets. Reinforced steel materials are used to fabricate the metal bins. We also provide customize metal bins as per need. Different kinds of metals and alloys are used to fabricate the metal bins to meet our customer’s requirements. We also provide anti corrosive metal bins, to work efficiently in aggressive atmosphere. 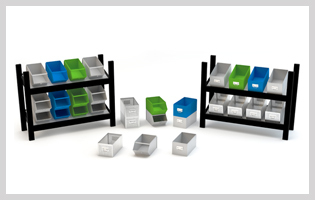 Metal bins are especially designed to stack one on one. They are ideally arranged in racks. Racks can interlock with each other, which provide excellent space saving system. These metal bins are also been convenient for the materials and products at work place.